Ever met a couple and wonder why they’re together? Maybe it doesn’t seem like they have anything in common. Maybe one of them is significantly more successful. Maybe they don’t even travel in the same social circles. Maybe there’s a big age difference. Hell, maybe all of these things are true, but for whatever reason, the pairing just works. This couple is delightful – their relationship is a marriage of everything good about both of them, no matter how improbable it may seem. Yeah? Well, Hyrule Warriors is a little like that. Taking The Legend of Zelda and Dynasty Warriors and throwing them into a blender shouldn’t produce anything worthwhile. It damn sure shouldn’t produce a good game. But it does. This probably still shouldn’t be so shocking 4 years after the original game’s release date, but it is. 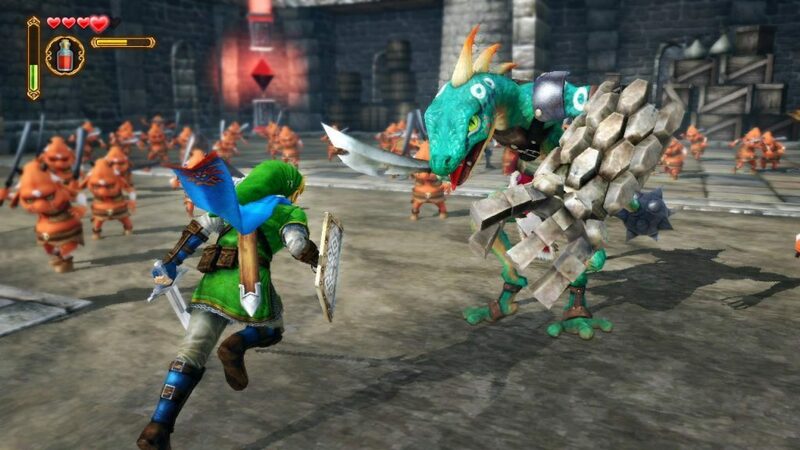 For those with short memories, the original Hyrule Warriors released on the Wii U in 2014, and was later ported to the 3DS with additional content. The Definitive Edition brings together the original Wii U release, its DLC, all the added content from the 3DS version, and some extras, too. "Hyrule Warriors takes the Dynasty Warriors base and adds a heaping helping of Zelda fanservice. The story conceives a way for multiple characters from all across the Zelda timeline to come together and take on a dark witch known as Cia." There’s some new content here, but the appeal of the game is the same: you’re gonna play as some Zelda characters, and you’re gonna murder thousands of monsters. If you’ve never played Dynasty Warriors before, it’s a tactical action game, or musuo, that places you in command of an army and asks you to capture points on a map, known as keeps, and complete certain objectives. You’ll also control an exceptionally powerful hero capable of killing hundreds of normal soldiers at a time. You’re powerful enough to turn the tide of battle at any point on the map, but you can’t be everywhere at once, so you have to manage fighting the battle in front of you with managing the flow of the battlefield. In general, the actual moment to moment gameplay in a Warriors game is pretty mindless, consisting of simple combos built around light and heavy attacks that will decimate pretty much everything around you. Managing the flow of battle and your objectives, which are often timed, isn’t, however, and this is where the strategy, and appeal of the musuo genre in general, comes in. Do you let a hero who is struggling fight alone for a little while longer so you can complete an optional objective, or rush to their side? 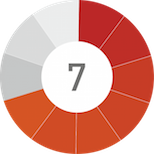 Do you methodically clear every keep or focus only on the ones you need? How you play actively changes how the maps flow and how battles shake out, so you’ll want to keep on your toes and move quickly. Hyrule Warriors takes this base and adds a heaping helping of Zelda fanservice. The story conceives a way for multiple characters from all across the Zelda timeline to come together and take on a dark witch known as Cia. Pretty much everyone you can think of is here – Link, Zelda, Ganondorf, Impa, Zant, Midna, Ruto, Shiek, Darunia, Ghirahim, the Skull Kid from Majora’s Mask – if you can name a recognizable character from the Zelda series, they’re probably in the game, along with a few original characters like the adorable Linkle (a female version of Link). Even Tingle makes an appearance. 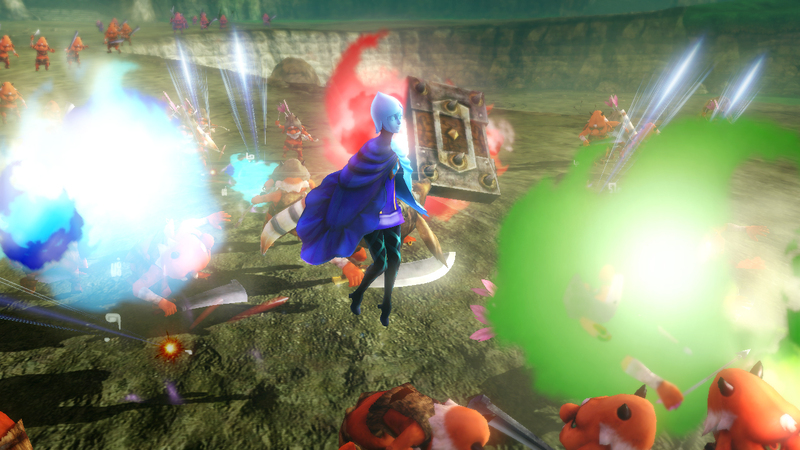 "While Hyrule Warriors feels like a musuo game, it also understands what is expected of a Zelda game. Collectibles come in the form of Gold Skulltulas, which must be found on the map, and items from treasure chests come with the traditional Zelda animations and music." Every character feels unique, despite the game’s limited options in gameplay. Impa’s enormous sword deals high damage and will cut through large groups of enemies with ease, while Zelda is quick and graceful and Link functions as a good all-arounder. Each character can wield multiple weapons, which adds to the variety; a Link toting the Master Sword is much different from one twirling a fire rod. Most importantly, all of the characters feel good, and the game goes out of its way to make them powerful. Killing enemies and completing objectives rewards you with experience, better weapons, and new items for battle. Enemies also drop items that can be used to forge new equipment between scenarios. Essentially, you fight enemies to get stuff that makes you better at fighting enemies. While most games have systems like this, Hyrule Warriors keeps its systems simple and easy to use, so it never feels like work. While Hyrule Warriors feels like a musuo game, it also understands what is expected of a Zelda game. Collectibles come in the form of Gold Skulltulas, which must be found on the map, and items from treasure chests come with the traditional Zelda animations and music. Even the levels feel similar, often requiring you to gain a new weapon, like a bow, boomerang, or bombs, to defeat a stage’s bosses and solve puzzles (and then rarely ever use it again). Even the story hits the traditional beats of a Zelda game. You can tell Omega Force but a lot of time and effort into getting the Zelda elements right, and their love for the source material positively radiates of the screen. Still, for all the trappings of Zelda, this is a Warriors game, and if you don’t like the genre, the Zelda theming is unlikely to change your mind.
" The biggest change is the addition of split-screen co-op. The Wii U version forced one player to use the TV and another to use the Gamepad if you wanted to play together, but the Switch version offers split-screen functionality whether docked on not, and allows co-operative play with only two Joy-Cons." Like most Warriors games, this one is packed with content. There’s Legends Mode, which comprises the core story, Free Mode, which allows you to play unlocked scenarios with any character, Adventure Mode, which tasks you with completing objectives on a map from the original The Legend of Zelda, and Challenge Mode, which offers a boss rush scenario, among others. 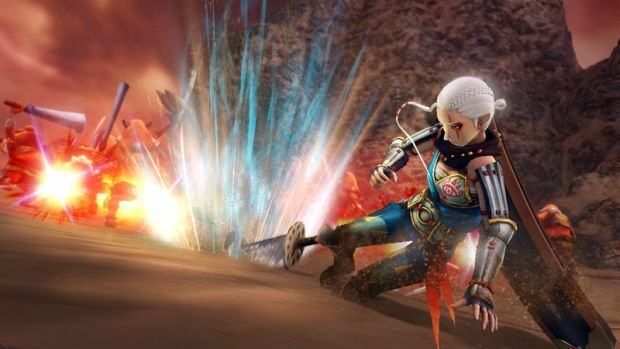 If you like what Hyrule Warriors offers, there’s no shortage of things to do. Unfortunately, if you’ve played Hyrule Warriors before, there aren’t many reasons to upgrade, aside from any additional content you may have missed. The game looks and runs better than it did on Wii U, though it still won’t maintain a pristine framerate in crowded areas. The biggest change is the addition of split-screen co-op. The Wii U version forced one player to use the TV and another to use the Gamepad if you wanted to play together, but the Switch version offers split-screen functionality whether docked on not, and allows co-operative play with only two Joy-Cons. Bafflingly, there still isn’t any online functionality, but the addition of a proper split-screen mode is a huge addition for those who want to play with a friend. Ultimately, how you feel about Hyrule Warriors will depend on two things: how you feel about musuo games in general, and how you’ll react to this odd marriage of Zelda and the Warriors series. It’s not for everyone, but if you can’t feel how odd it looks behind you, you might find yourself a in a relationship that you never knew you wanted… and one that doesn’t make sense to anyone else. All of the content from the Wii U and 3DS games, plus all the DLC. Solid marriage of gameplay and strategy. Lots of modes to play. The characters are fun and distinct. Captures the feel of the Zelda series. Split-screen co-op. Graphical and frame-rate improvements. No online play. Musuo gameplay is incredibly simple. There are not many reasons to upgrade for those who already own the game.